Funny how even today people believe that North Carolina, Kitty Hawk to be more precise, is where the Wright Brothers lived, worked and experimented with a practical flying machine. Well, part of that’s correct, they did fly for the first time on the sandy dunes of the Outer Banks. But come on, the only reason that happened is the Wrights got lost on their way to Dayton (lol), but I digress. For the folks who may not know Wilbur and Orville did all the heavy lifting in Dayton, Ohio, (Get it, heavy lifting as in ‘heavier than air’ airplane?) the one and only “Birthplace of Aviation”. It’s a no brainer then that one of the best air shows in the country would be hosted in DAYTON. Because, each summer, DAYTON MEANS AIR SHOW! Mark your calendars to be in Dayton for the air show each June. This spectacular event, held at the Dayton International Airport, provides thrilling entertainment at incredibly reasonable prices. So, ladies and gentlemen start your jet engines ‘cause it’s air show time once again June 21-22, 2015. Founded in 1975, the Vectren Dayton Air Show Presented by Kroger is one of North America’s premier air shows featuring world class aerobatic champions, military jet demonstrations and entertainment for the whole family. Not only do we celebrate Dayton’s rich aviation heritage as home of the Wright Brothers, but Wright Patterson Air Force Base, the National Museum of the U.S. Air Force and National Aviation Heritage Area, all call Dayton home. The 2015 Vectren Dayton Air Show Presented by Kroger promises to deliver an action-packed weekend of thrills, and lots of fun too. So now, get a load of this, flying fans. For the first time since 2013, TWO jet teams will perform. The US Air Force Thunderbirds are back along with the Breitling Jet Team from Dijon, France. But wait, there’s much, much more. The U.S. Army Golden Knights, "Screamin&apos; Sasquatch" Jet Waco, Sean D. Tucker, Shockwave Jet Truck and Matt Younkin Twin Beech all together in the 2015 show. “What an incredible show we have for Dayton this year.” says Michael Emoff, Chairman of the United States Air & Trade Show Board of Trustees, the governing organization of the show. “Two jet teams joined by some of the best aviation talent in the world.” And Michael if I might add, it doesn’t get any better than that, plus there is truly something for everyone, including the kids. The Vectren Kids Hanger presents the Aerospace Adventures program hosted by the National Aviation Heritage Area and will be providing interactive, hands on activities, experiments, and demonstrations to children ages 6-16. And don’t forget the static displays, great food and beverages. 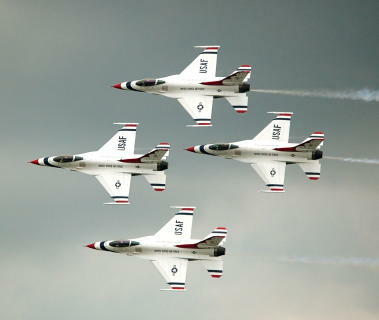 I could go on and on and on, but I won’t, so your best bet is log on to www.daytonairshow.com. There you’ll find discount ticket options, park and ride opportunities and everything you need to know about the 2015 Vectren Dayton Air Show presented by Kroger. This 41 year summer tradition promises to deliver tons of high flying fun. The Wright Brothers would be proud! Cheers and fasten your seatbelt.